Panama Canal cruises have been gaining in popularity in recent years. They are usually coupled with a few stops along the Caribbean coast of Central America. Most cruise lines have to stick to busy cruise ports because they are too big to dock elsewhere. In fact, they sail right past some of Panama and Costa Rica’s most beautiful natural areas. 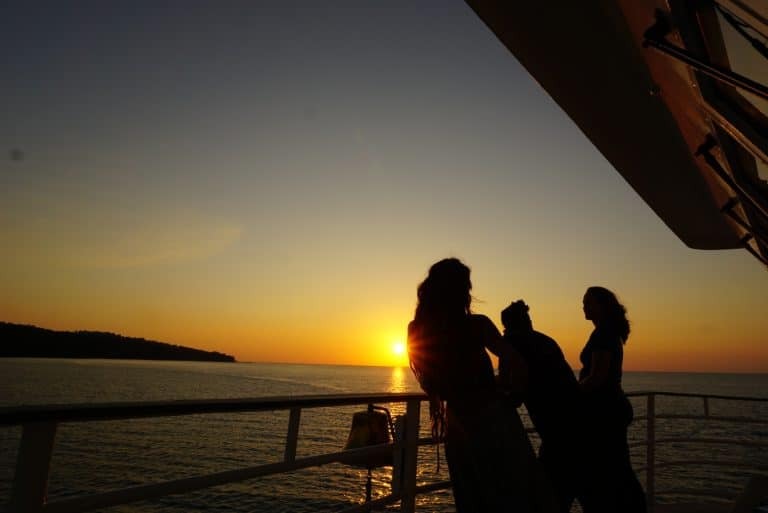 Uncruise’s Panama and Costa Rica cruise takes the opposite approach. If you dislike crowds, love nature, and prefer to adventure where few have gone before, here is the alternative. The Pacific coastline of Costa Rica and Panama is a varied landscape. It’s rugged, wild, and teaming with life. Remote villages and deserted beaches are strewn loosely between large swaths of protected land. Getting to some of these places over land requires an arduous journey or is simply impossible. For wildlife, it’s a haven. 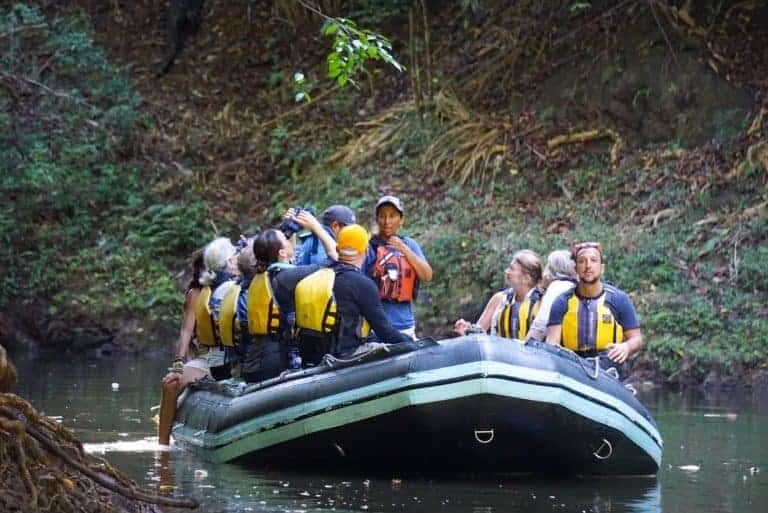 On this Uncruise itinerary, we hug Costa Rica and Panama’s Pacific coastline and explore pristine nature with naturalist guides. 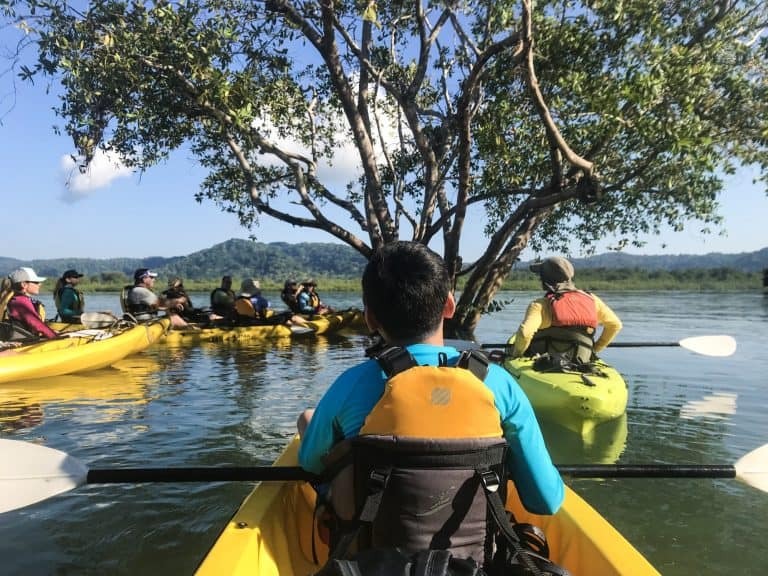 Thanks to Uncruise Adventures for hosting us to experience their Uncruise Costa Rica and Panama itinerary so we can unpack it for Trekaroo families. 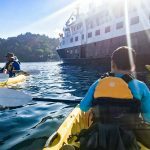 We are also delighted that as an affiliate of Uncruise, we were able to secure a special Uncruise discount for Trekaroo families. It’s rare for me to travel one-on-one with my middle child. He often moans, “It’s hard being in the middle. I get lost.” Now that he is 13 years old, I sense our connection slipping. His interests are quite different from mine and I struggle to find that common ground. But we both love to travel and encountering wildlife. As the two of us step onboard Uncruise’s Safari Voyager together, I’m hoping for unforgettable bonding memories as we delight in nature together. 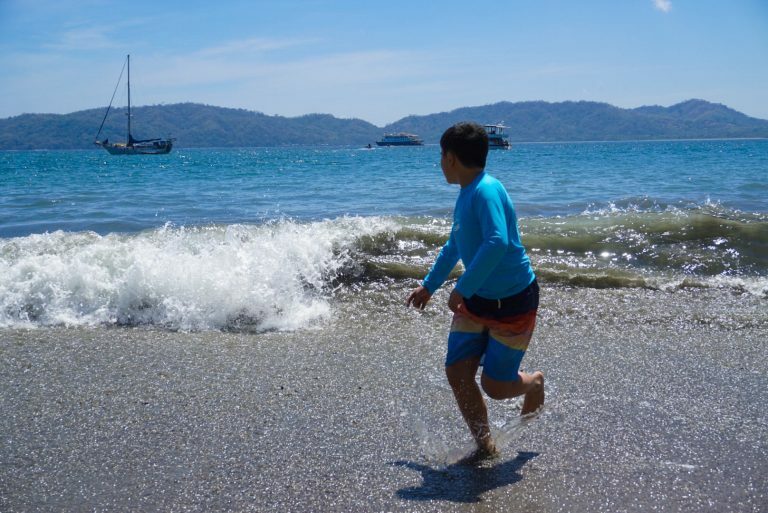 The town of Puntarenas is about 75 minutes from San Jose on the inner hem of the Nicoya Peninsula. 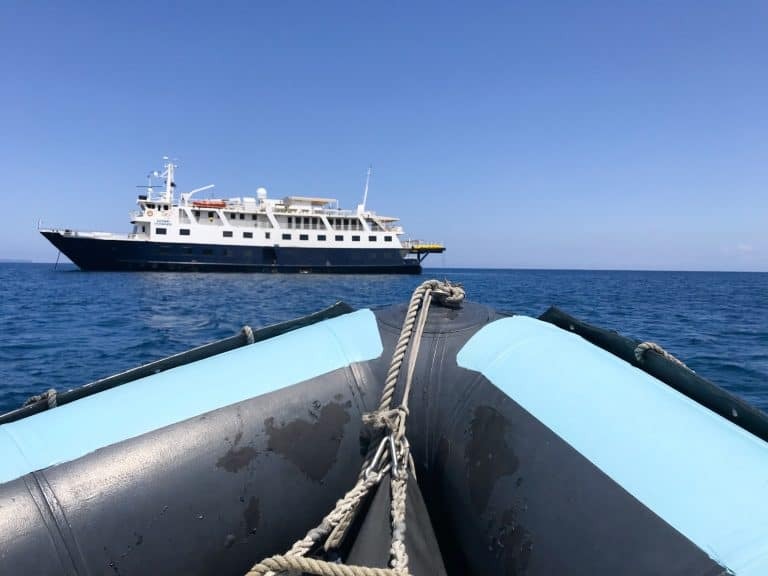 Here we meet our Uncruise expedition vessel – the Safari Voyager. This small cruise ship has only 32 guest cabins for 62 passengers, and half as many crew members. The crew picks us up on skiffs and we bounce up and down making our way out to our home for the next few days. The black skiffs pull in at the back of the Safari Voyager and a platform winds up to lift the skiff right out of the water. We’re like a big whale being lifted out of the ocean. The skiff lifter is a brilliant way for younger and older passengers to get on and off the skiffs with ease. The friendly crew takes us to our cabins. Our bags have already arrived ahead of us. As soon as everyone settles in their cabins, the captain invites us to a welcome reception of champagne cocktails and hors d’oeuvres. We meet the other passengers and the friendly crew, go over safety procedures and drills, and set sail. Just as the sun sets, the chef invites us to feast on the first of many delicious meals he’s prepared. Tonight’s menu is sesame encrusted mahi-mahi tuna, bright pink Panamanian potato salad, beef tenderloin, and grilled Portobello mushrooms stuffed with grilled vegetables and goat cheese. As I look around the room at the fellow passengers on board this small cruise ship, I wonder, “How are we going to fit in?” My son is the only child on this particular sailing because we aren’t traveling during a regular school holiday. A small ship cruise is an intimate setting. At mealtime, you sit with other passengers. You can’t help getting to know each other’s joys and fears on a nature expedition like this. And if your kids are having a moment, it’s hard to hide that as well. Trekaroo Tip: Does your family have a special diet or allergies? Every Uncruise expedition has a private chef and pastry chef catering to any dietary requirements. We were blown away by the quality of meals offered to everyone regardless of their dietary restrictions. Be sure to provide all that information before you sail and let the chefs and servers know as soon as you arrive. After a couple of hours of sailing, we anchor at Curú Wildlife Refuge (Refugio Nacional de Vida Silvestre Curú). 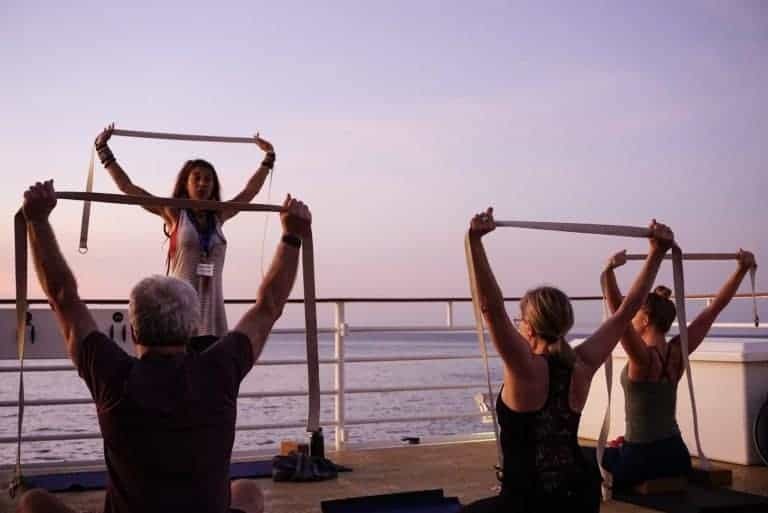 Just before sunrise, a few early risers creep up to the sun deck to salute the sun with sunrise yoga while others prepare for an early morning birdwatching hike. A hearty breakfast of tomato salsa frittata, roasted potatoes, bacon, and fruit salad fuel us up for our first expeditions of the trip. We head down to the skiff platform for the first of many shore excursions. With guests that range from as young as 8 to 80+, keeping adventurers of all ages safe is a huge priority for the crew. As we load up to head to shore, there are crew members making sure no one trips, falls or loses their balance. It’s incredible watching their attentiveness to each guest. Today, we are hiking through the dry tropical forest. 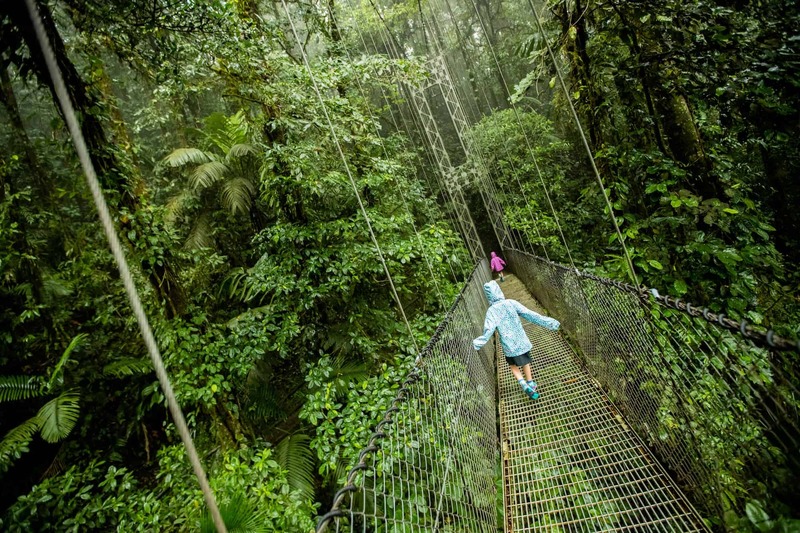 It’s one of Costa Rica’s 12 life zones. The dry tropical forest once stretched from the northern part of Costa Rica to the Mexican border but is now largely destroyed. 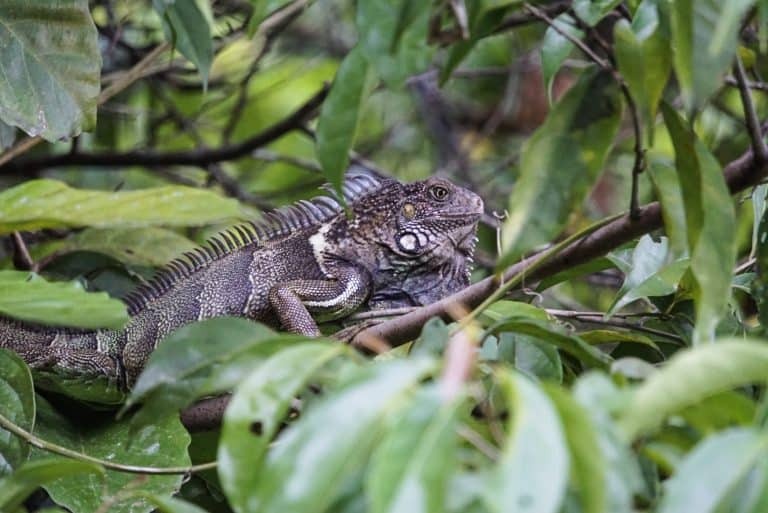 The Nicoya Peninsula is one of the largest remaining areas where the endemic plant and animal life find refuge. The Curu Wildlife Refuge is a private research facility. Once we dry our feet off and put on our hiking boots, we bump into a family of curious coatis – a raccoon-like creature that roams the forest floor. Their little paws crunch on a thick carpet of dry leaves as they waddle across the forest floor. It’s the dry season here in the forest. The animals are even more active at this time of the year because they have to search a much larger area to find food. Us humans feel the heat as beads of sweat drip down our forehead. 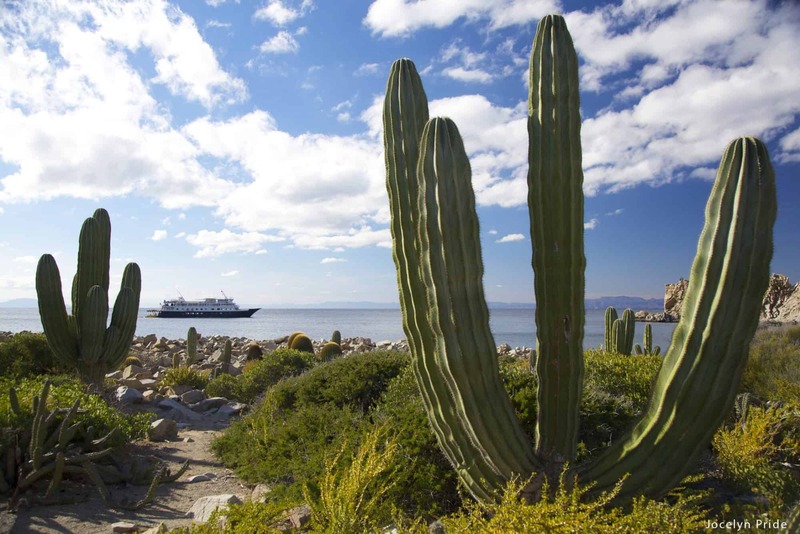 The dry heat reminds me of riding burrows in the Baja California desert when we were on a Mexico Sea of Cortez Cruise with UnCruise Adventures. Along the Monkey Trail (Sendero de Monos), creatures call with their fierce, dinosaur-like howls. “That’s a howler monkey! ” says our guide. We can’t see the troop yet, but we can certainly hear them. Our guide explains that howler monkeys are mostly herbivores. For that reason, their metabolism is slower, and their energy level is less active. Their frightening howl is the way males guard their territory without fighting or moving too much. My son crouches over a hole in the ground. “What’s in here?” he hollers to the guide. One of my favorite things about exploring with kids is that they always pay attention to things that us adults walk right by. Fortunately, the guide knows exactly what’s in there and shouts back, “land crabs!” just before my son sticks his finger in the hole. The further we walk, the closer the howler monkeys sound, until we finally see them high up at the top of the forest canopy. They are just chilling out in the trees. 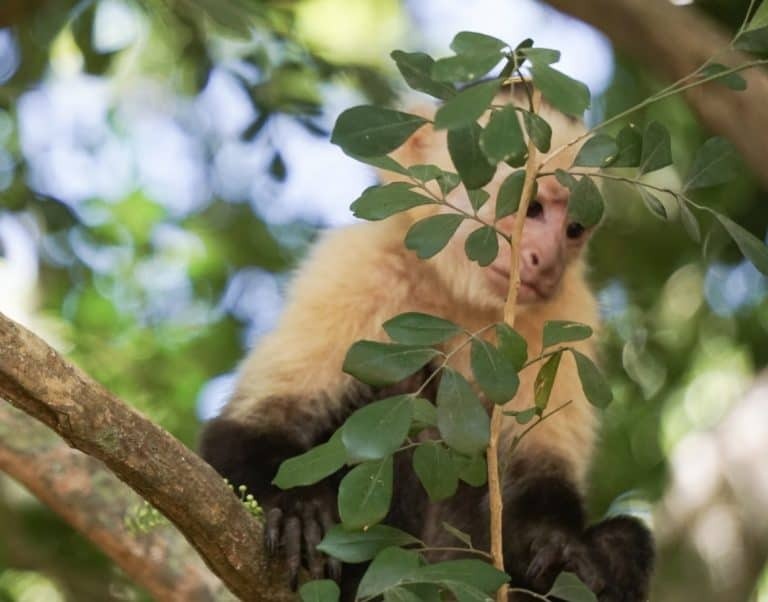 When we return to the trailhead, a mischievous troop of white-faced capuchin monkeys greets us. They refuse to sit still for a photo and are fearless in approaching us. One steals a grapefruit from our guide and scurries off. Over a light Mediterranean-themed lunch of chicken shwarma and falafel, the Safari Voyager sails to Ballena National Marine Park (Bahía Ballena), a secluded beach along the Costa Rica’s southern Pacific coast. We join local families for a swim in the warm, calm water. It’s just what we needed after the hot morning hike. Having fun sure works up a hefty appetite. By 5 pm, everyone is showered and ready for drinks and appetizers as we learn about what adventures tomorrow holds. After dinner, one of the naturalists shares her fascination with the smallest creatures of the forest – different types of ant colonies. Wanna go an Uncruise Adventure? Exclusive discount! Trekaroo families get $100 off per cabin (double occupancy) ON TOP OFF any other offer. Kids always get $500 off. Trekaroo is an affiliate partner with Uncruise. Which means we secure extra perks for you. Overnight, we sail to the northern elbow of the Osa Peninsula. We anchor at Campanerio Biological Station (Proyecto Campanario), located on the fringe of the mysterious Corcovado National Park (Parque Nacional Corcovado). The vegetation is dense and green and the air is fresh but moist. The forest looks impenetrable from the water. After breakfast, the skiffs deposit us on a small sandy beach for our shore excursion into the rainforest. Our Costa Rican guide leads us up a series of stairs packed between spreading tree roots. The trail narrows, engulfing us in a rainforest cathedral. We are nose to nose with large palms, giant Twizzler aerial roots, and skinny pole-like tree trunks. Trying to be quiet is impossible. Everyone is tripping over with questions, curious about every peek, squeak, and flutter in the leaves. With her super naturalist sixth sense, our guide points out little snakes, lizards, and a camouflaged frog. They hide so well in this “Where’s Waldo” forest. Our naturalist is as excited about each discovery as we are. The birds of the rainforest aren’t quite as shy. A confident yellow-breasted Toucan squawks from the top the canopy, while a pretty thrush sings his mating song. The walk to a refreshing waterfall is short, but we meet many rainforest creatures along the way. I want to keep exploring. It feels like we’ve just skirted the fringe of Corcovado National Park. 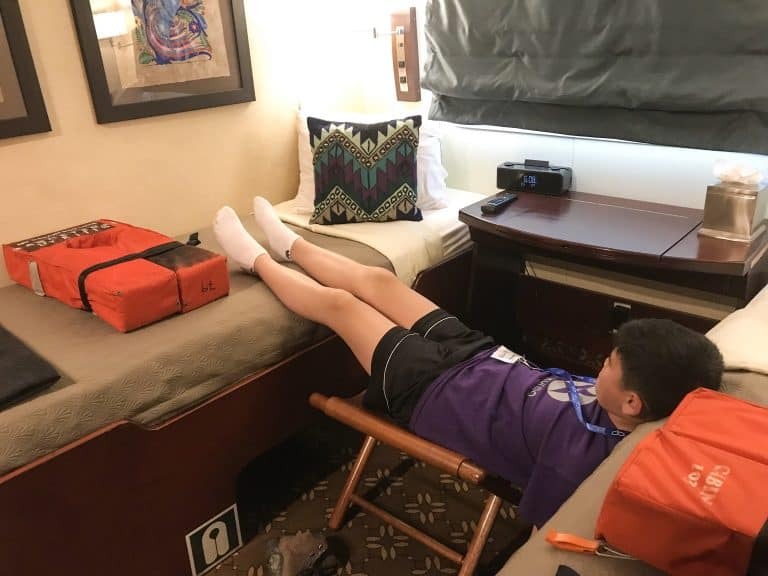 I was a little sad that my son had chosen to rest on the ship this morning because he was feeling dehydrated from the day before. At the same time, I was glad that even though he wasn’t up for a trek into the rainforest, there was the option of leaving him safely on the ship while I enjoyed the adventure. Trekaroo Tip: Hydration in hot and humid climates is very important. Each Uncruise vessel has its own desalination equipment. They also provide electrolytes on board. Be sure to keep your kids hydrated. Seasickness may not always manifest with nausea. Always comes prepared with seasick pills, a patch, or one of these drug-free anti-nausea wristbands. Back for lunch onboard the Safari Voyager, we wolf down huge mahi-mahi tacos with sweet mango salsa. As we dine, the engines rev up once again for a short sail to Drake Bay (Bahía Drake). We discover that our skiff drivers are all from this small fishing village. This afternoon, they take us to explore their old stomping grounds by skiff. Augjitas River (Rio Agujitas) is a narrow river channel flanked with rainforest. Wildlife comes to this brackish river to feed. 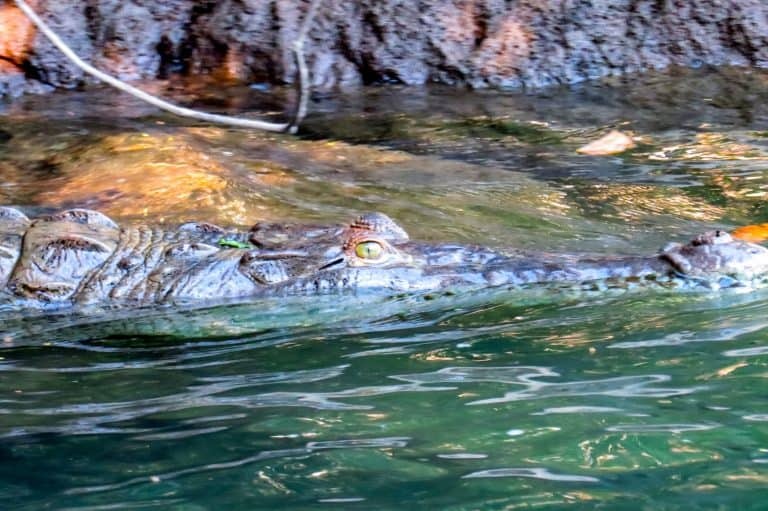 Upon entering the mouth of the river, we see a 5-foot long crocodile. His eyes are barely above the surface of the water. He is spying on us like we’d make a good dinner. The river narrows quickly. On the rocks and overhanging branches, we spot a kingfisher, a couple of tiger heron, pipers, and more howler monkeys. We even notice a family of large turkey vultures hanging out in the towering coconut trees. Except for a few kayakers from a nearby ecolodge, this expedition is uniquely intimate. We return in time for cocktail hour followed by dinner. Each meal is better than the next. 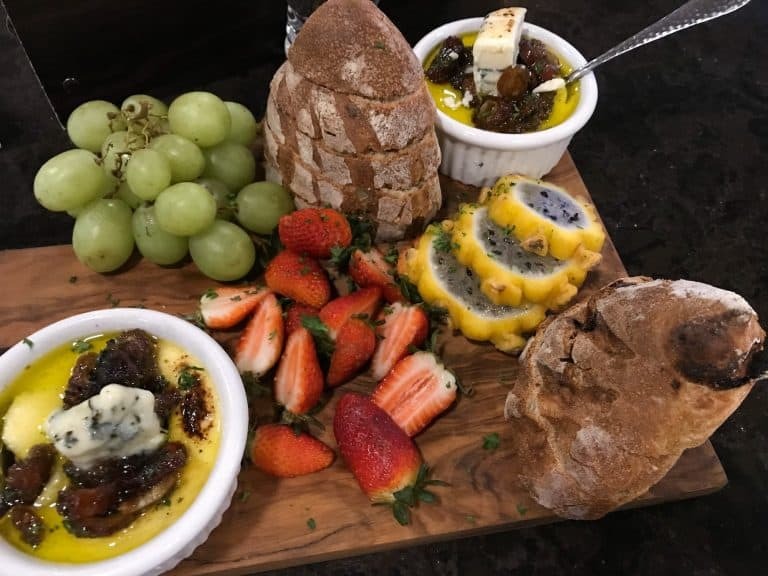 Tonight, the highlight is freshly baked fig bread paired with a decadent blue cheese creme brulee topped with jujube date marmalade. It is the perfect meal to cap off a perfect day. Overnight, the Safari Voyager sails around the Osa Peninsula into the protected waters of Golfo Dulce. 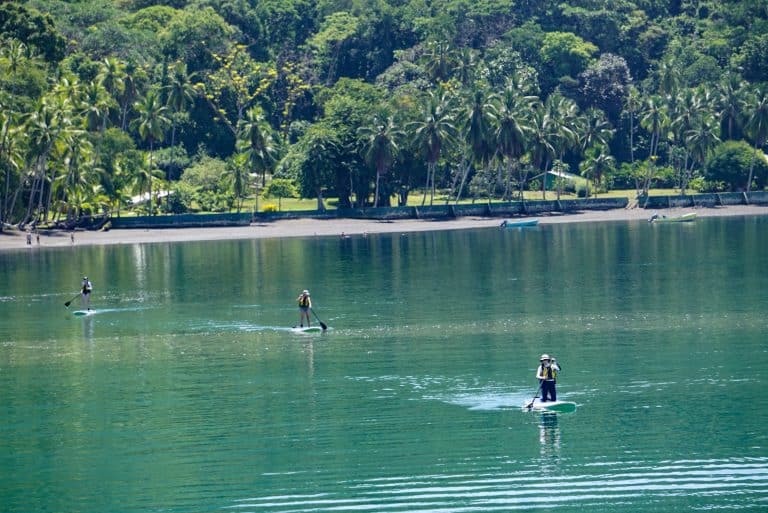 Golfo Dulce is one just four tropical fjords in the world. Glaciers didn’t form this body of water, but it is deep and flanked on three sides by protected tropical rainforests. It’s a great place to see humpback whales, bottlenose dolphins, spotted dolphins, spinner dolphins, and whale sharks. 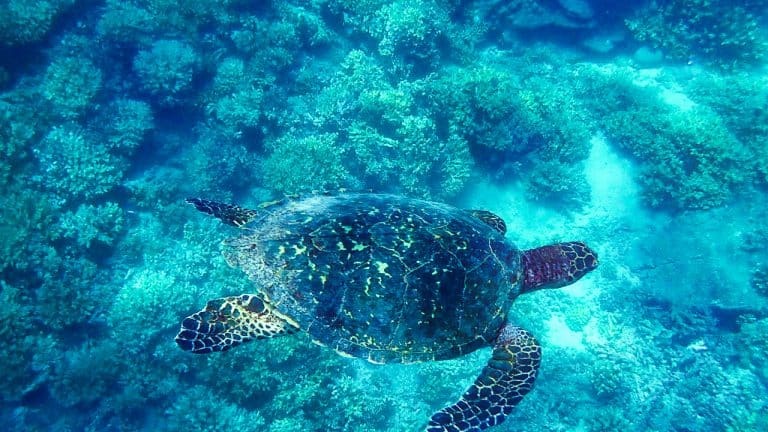 There are four different types of sea turtles in these waters including the Pacific green sea turtle, the olive ridley sea turtle, the hawksbill sea turtle, and the near-extinct pacific leatherback sea turtle. Over 2 million years ago, what we now call the Osa Peninsula was once an island. Here, flora and fauna evolved in seclusion. When the island connected with the isthmus of Central America, animal species migrated into the lush rainforest area. The Osa Peninsula remains relatively untouched by humans and is considered by National Geographic as one of the most biodiverse places on the planet containing 2% of the world’s biodiversity in it’s 700 square miles. 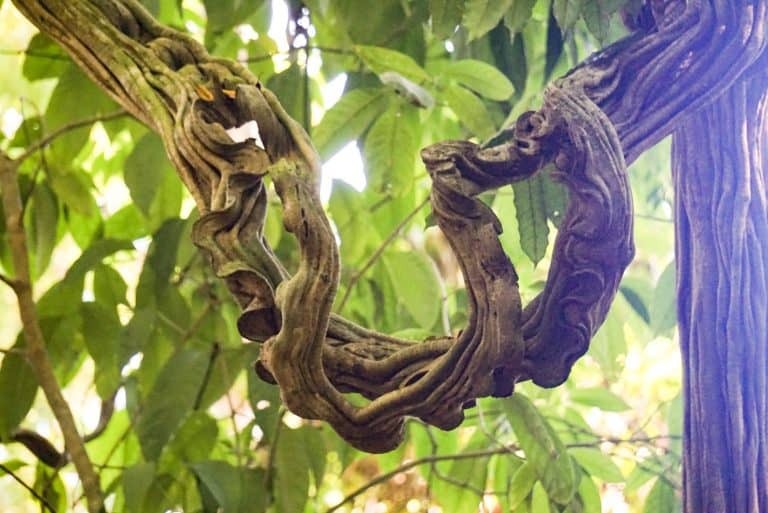 New plants and animals are still being discovered regularly in this dense tropical rainforest. Our ship is docked at the mouth of the Esquinas River (Rio Esquinas), the protected armpit of Golfo Dulce. 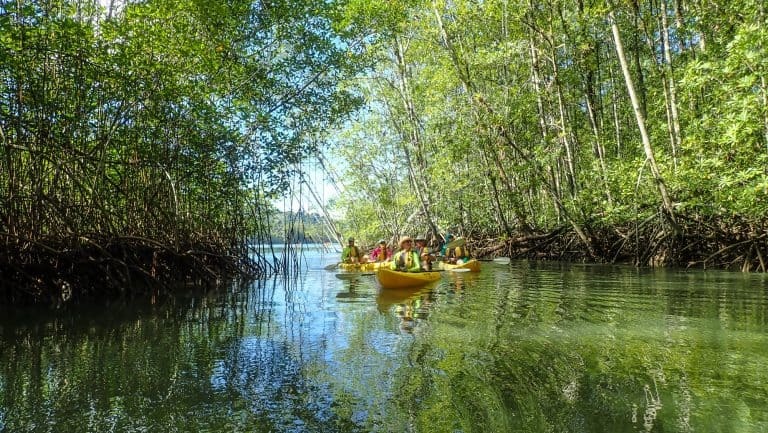 Lining this rich sedimentary river is a pristine mangrove forest which gets flooded twice a day by tidal flow. The expedition team knows this is the perfect spot to explore by kayak. 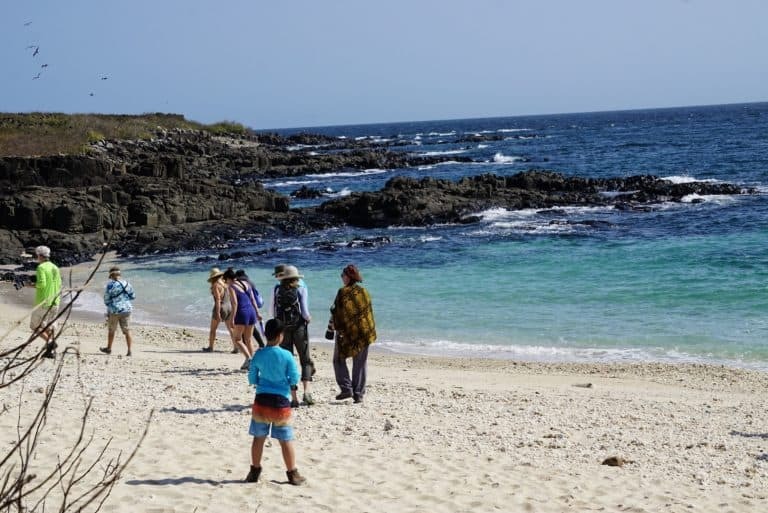 Our Costa Rican guide is local to the Osa Peninsula, and he takes us to uncover his little piece of heaven. The kayaks launch four at a time. A safety skiff is close by in case anyone gets tired. If you have a co-pilot like my son who takes way too many breaks, you’re grateful to have the option to be towed if the need arises. 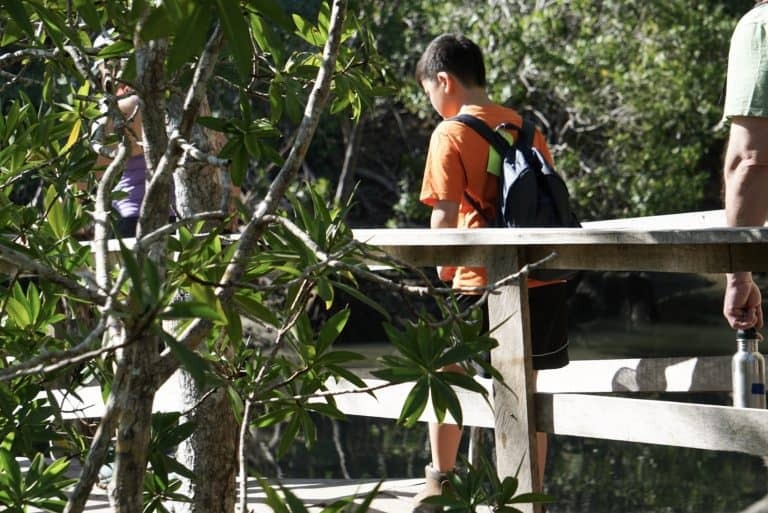 We learn that mangrove forests play a critical role as natural fish nurseries and offer storm protection. Unfortunately, in many parts of the world, mangrove forests are being destroyed and polluted. Fortunately, here in the deepest reaches of Gulfo Dulce, they were pristine and healthy. We meet a few tiger herons fishing in the shallows and crabs scurrying between protruding mangrove roots. Egrets and frigate birds skim the water and dance between treetops. 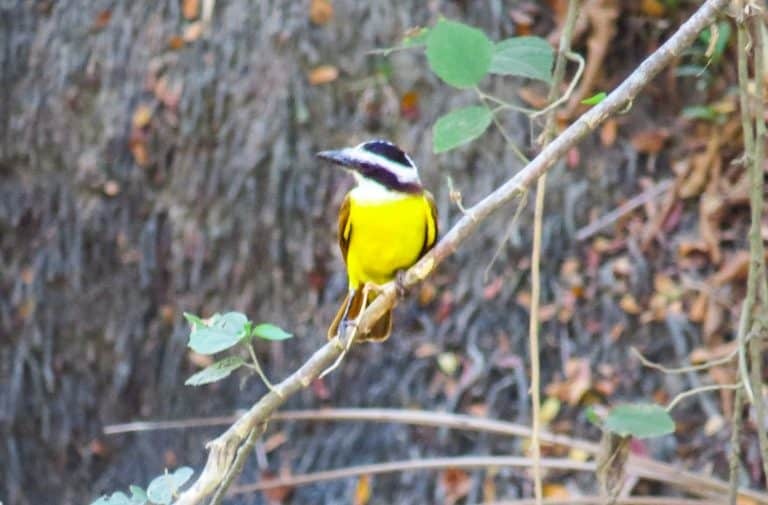 Some passengers spend the morning bird-watching around the grounds of Saladero Eco Lodge. 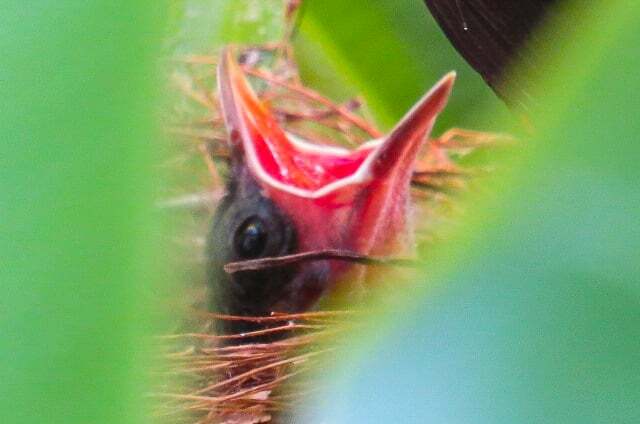 They return with beautiful photos that make the rest of us jealous, including one of a frigate bird feeding his baby chick. Others enjoy a guided nature meditation exercise. When we convene for lunch on board, there is still time for paddle boarding on the glassy water. Over lunch, we sail to the border town of Golfito to clear immigration. We leave the Costa Rica Cruise portion of our journey behind and prepare for new adventures in Panama. My tired shoulders are grateful for a perfectly-timed massage. 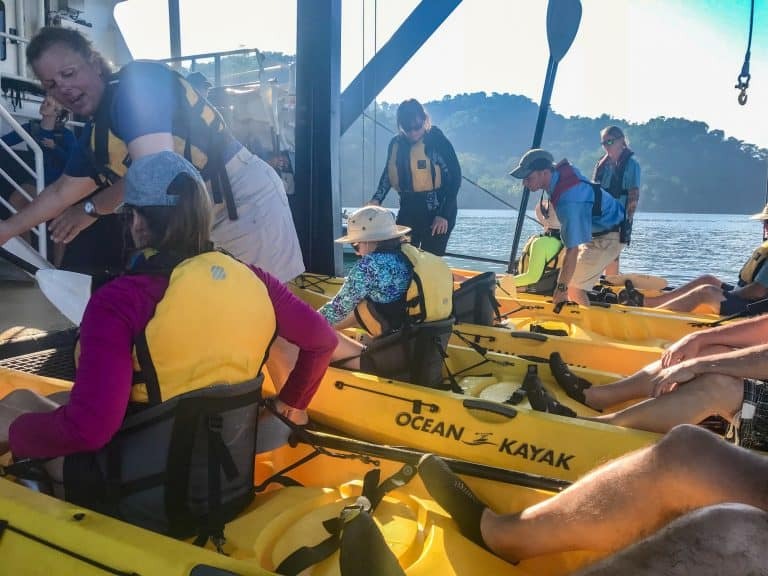 Trekaroo Tip – If you like kayaking, I would recommend strengthening your shoulder and back muscles before embarking on your Uncruise vacation. And be sure to pack some pain medication and a heating pad to soothe sore muscles. You’ll want to be active on this vacation. There are so many fun things to see and do. We sail all night tracing the Pacific coastline of Panama as it bends east-west. Here in the Gulf of Chiriquí, we enter Coiba National Park. 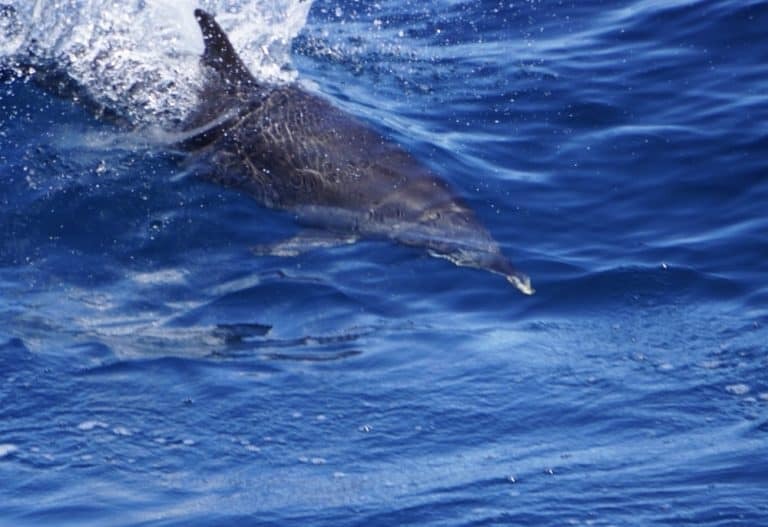 A friendly pod of spotted dolphins welcomes us to their tropical paradise by riding the wake of the Safari Voyager. Lucky for us, the calm sea on this sunny day means we get to spend the day on a tiny tropical island called Granito de Oro (Little Grain of Gold). It lives up to its name – rocky outcropping on one end, a sandy white beach on the other, and three coconut trees sticking out in the middle. It’s the picture of paradise you’d rip out of a magazine to put on a vision board. The waters surrounding the islands are every shade of blue from a deep aquamarine to a translucent turquoise. On beach days, the expedition crew sets up a beach station with a shade canopy, drinks, snacks, beach chairs, towels, sunscreen, and insect repellent. The sun was out in full force, so we slathered on reef safe sunscreen, pulled on snorkel, masks, and fins, and headed out to swim around the island. 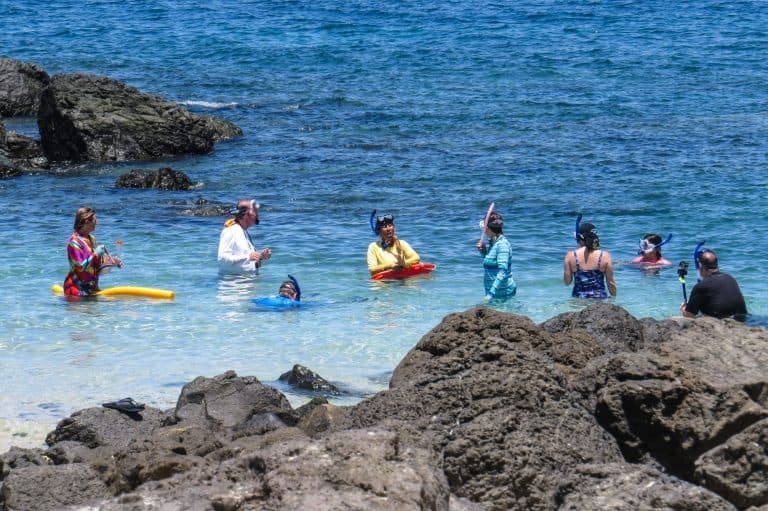 Those who needed a refresher on snorkeling 101 stayed on the protected side of the island by the shallow coral reef. 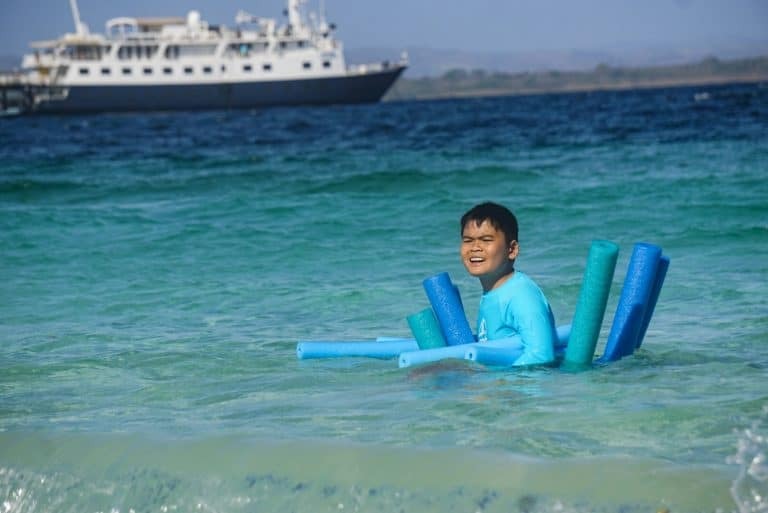 The rest of us couldn’t wait to snorkel around the island with the promise of meeting sea turtles, small reef sharks, and goofy guinea fowl puffer fish. Although we did not encounter any issues, I was grateful for the safety skiff trailing us. I never know when my kids are going to panic about water in their mask, being too cold, or any other complaint. The last thing I want to do is to have to stop snorkeling myself! 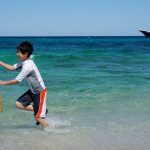 Trekaroo Tip – The water was warm, but if you have a child who gets cold easily in the ocean, it is a good idea to bring along a thin youth wetsuit. We loved the suggestion on Uncruise’s packing list to pack SPF long sleeve swim tops and SPF leggings to protect you from the equatorial sun. It will also keep you safe from stinging creatures in the water while minimizing the use of coral damaging sunscreen. If you have a child with small feet or face, bring their own youth size fins and mask that you know fit. 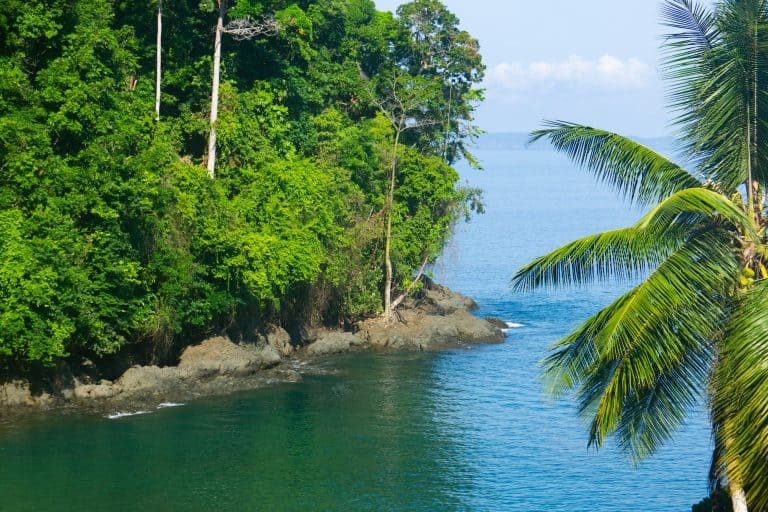 Coiba National Park in Panama has a fascinating history. The largest island was considered the Alcatraz of Panama. This penitentiary housed criminals and political dissidents until the military dictator Manuel Antonio was removed from power with the help of the U.S. in 1989. 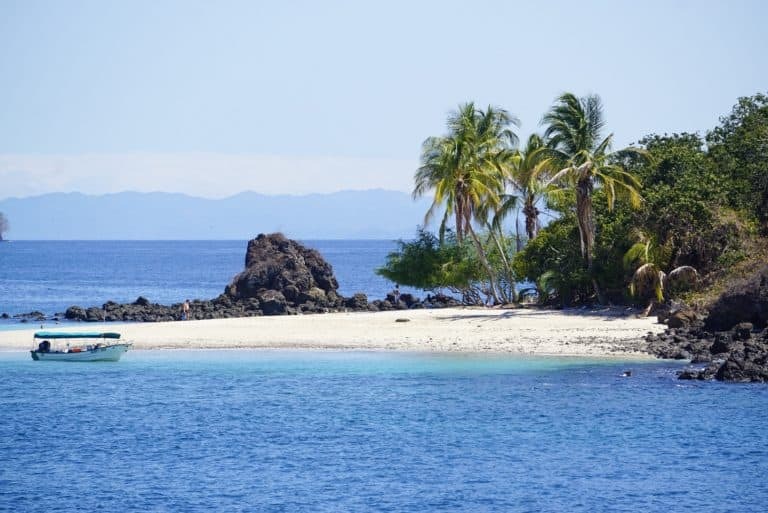 This left Coiba island relatively untouched by development. After 1989, it was recognized as a national treasure and gained its new status as a National Park. Within the park live several endemic species of plants and animals. And the pristine waters of Coiba National Park protect many marine creatures including four species of turtles. We were lucky enough during our snorkel to meet one of them. Sailing further south once again, we arrive at Iguana Island, a wildlife refuge and nesting site to thousands of magnificent frigate birds. As soon as we step onto the beautiful sandy beach, we realize the sand is alive with millions of hermit crabs. Funnily, iguanas were probably the least numerous wildlife on Iguana Island. 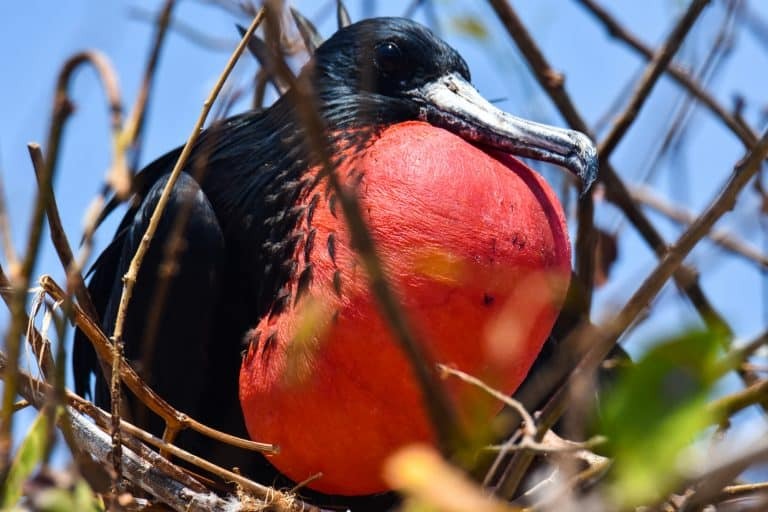 Our guides take us on a short walk and share with us about the unique behaviors that earn the magnificent frigate bird its nickname “Pirate bird.” I was glad when we moved further away from their unceasing circling around their nesting site. After another delicious lunch on board the Safari Voyager, I almost don’t make it back to the beach. But I am glad that my son begs to get back there because when we return, it feels like a different beach. The water is calm and the tide has gone out. I put on fins and a snorkel and explore the reef just offshore where I meet a chompy parrot fish, an octopus, and a giant green moray eel. By this point in the trip, my worries about feeling out of place are gone. My son is floating on pool noodles and chatting up the friendly adult passengers. It feels like we were just a group of friends on vacation together even though he is the only kid on this particular sailing. Everyone is trading stories of their favorite UnCruise itinerary. 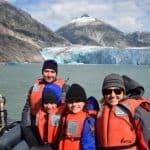 Everyone agreed that explore Alaska with on a small cruise ship with UnCruise is a phenomenal experience. That evening, after dinner, we anticipate the grand finale of our week with Uncruise – the sail through the Panama Canal. We watched a fascinating documentary about the history of the Panama Canal. Just two years ago, our family visited Panama and saw the Miraflores Locks for the first time. I couldn’t wait to sail through this remarkable work of engineering and experience it up close. The big day is finally here. 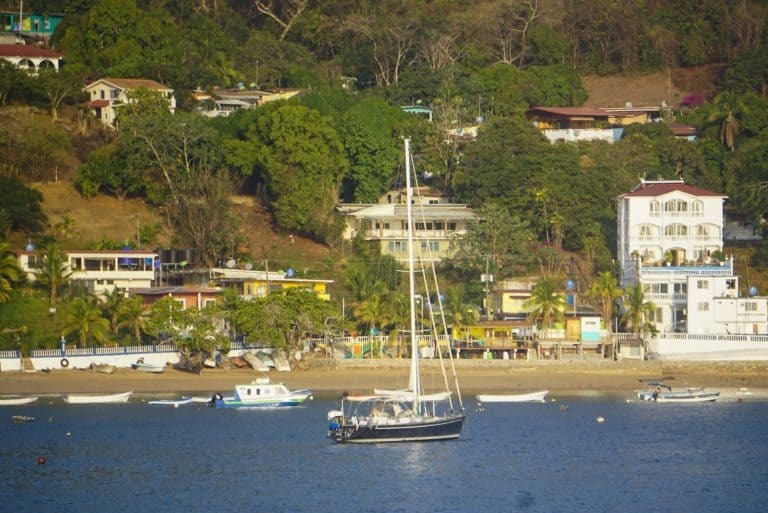 At morning yoga, we arise to see the sun shining over the colorful fishing village of Taboga which sits close to the mouth of the Panama Canal. We can see the faint outline of Panama City and a few large ships. We’re excited to join other ships to sail the world’s most remarkable feat of civil engineering. 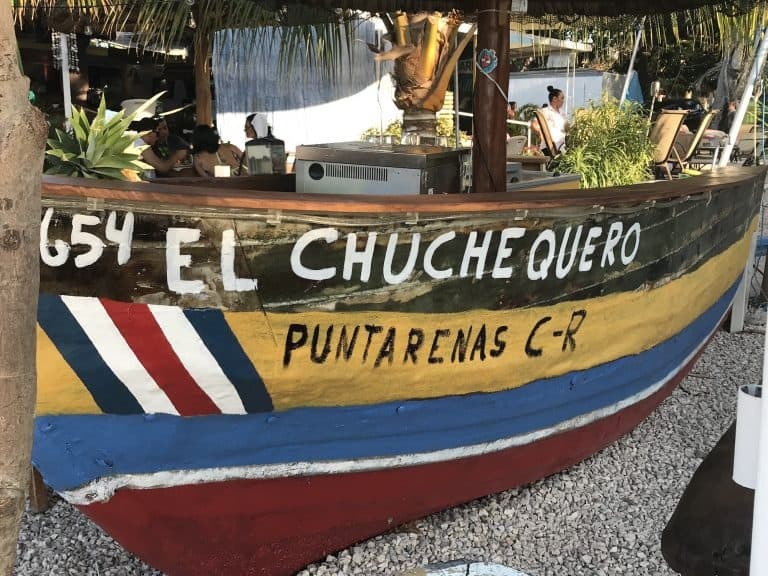 In the morning, we visit colorful Taboga, enjoying some ice-cold coconut before sailing into our position just outside the Bridge of the Americas. Here we await all the procedures required to enter the canal. As we sit down at sunset to a prime rib dinner, the Panama Canal pilot takes over command of the Safari Voyager. Thus begins our journey through the Panama Canal. The approach through the Bridge of the Americas is impressive. The Safari Voyager is a fly on the water as we sail up next to enormous cargo ships stacked seven stories high with container boxes. The giraffe cranes that you see at many ports of call look like skyscrapers up close. We notice a small boat cozying up to ours as we near the Miraflores Locks. A door at sea level opens on the Safari Voyager, and 14 rope pilots climb onboard while both our vessels are moving side by side. The pilots get in position on all four corners of our boat. As we enter the first lock, another person in a rowboat throws a rope to the rope pilots. They catch it, and we’re connected by cable to 4 locomotive mules on the canal wall. These four cables tighten and stabilize the Safari Voyager in the middle of the canal. Together, they guide our dwarf vessel to the front of the first lock, while another larger ship files in behind us. 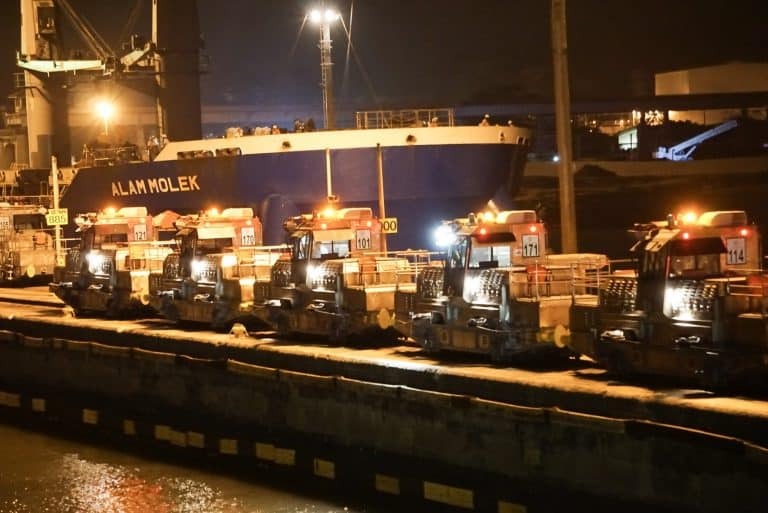 As soon as our partner vessel is in place, the massive lock gates close. It is so well balanced that it only takes a motor the size of a lawnmower to close the massive gates. Once tightly sealed, 52 million gallons of water from Lake Gatun begin to fill the lock chamber using only the force of gravity. Within about 8-minutes, the level of the bottom lock is the same as the higher lock. The upper gates open just as smoothly, and we sail slowly into the next lock chamber. The Pacific lock system has a series of 2 locks connected by a short ride through a channel. As we proceed through each stage of the process, our Uncruise guide explains what is happening. It is a fantastic experience taking a Panama Canal cruise in a small vessel because you can walk around the whole boat watching every detail of the process. After passing through the Pedro Miguel Locks, we are 85 feet above sea level. The lights of the Panama Canal dim inside of Lake Gatun (Lago Gatún), an expansive man-made lake. 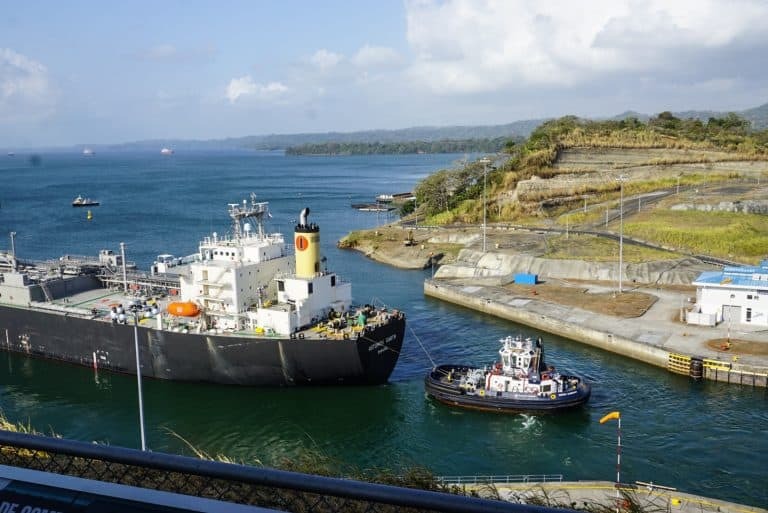 On any given day, ships of every size and function can be seen making their way across Lake Gatun on their way from the Pacific Ocean to the Caribbean Ocean or vice versa. Eight hours after beginning our cruise through the Panama Canal, we wake up in Colon on the Caribbean Ocean. 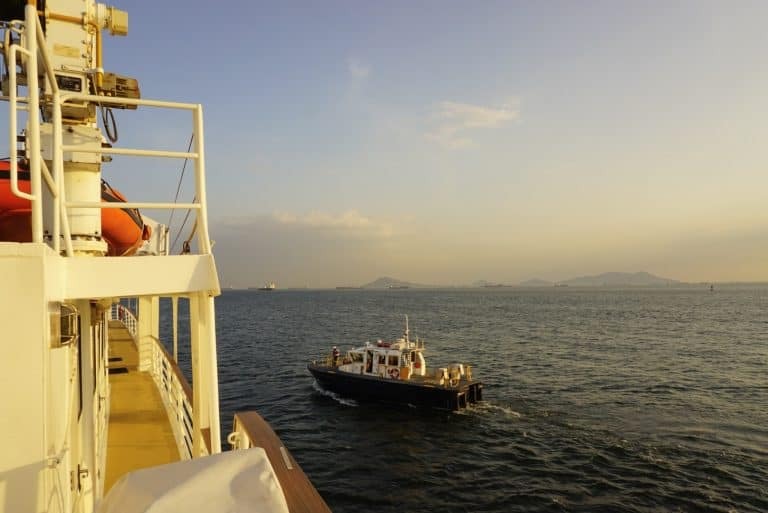 Our Panama Canal cruise crossing is complete! It’s a journey made possible only by the ingenuity of the human imagination and the determination of many thousands of workers. The significance is not lost on us. The history of the Panama Canal was fraught with loss and ugly politics, but one can’t help standing in awe of this engineering marvel. While the crew of the Safari Voyager prepares for its next group of adventurers to arrive that same day, we board a bus to see the other side of Panama. We stop at the Aqua Clara Locks visitor’s center to observe the new larger lock system that Panama completed a few years ago. 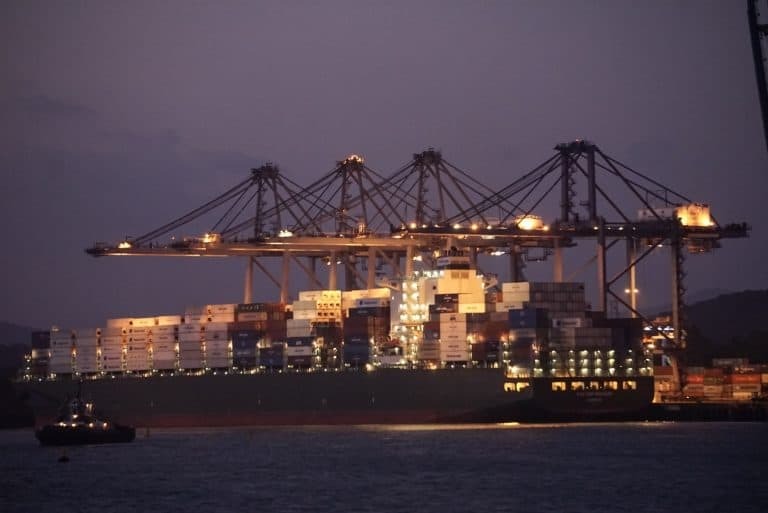 It makes it possible for even larger vessels to sail the Panama Canal. We see Lake Gatun in daylight, cross the mighty Chagres River, and arrive in Panama City. It’s sad to say goodbye to our new friends, but we’re full of gratefulness for a week well spent. 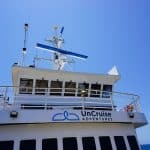 Disclosure: I was hosted by Uncruise to experience their Costa Rica and Panama itinerary, but these opinions are entirely my own. Trekaroo is also an affiliate of Uncruise which means that we’ve secured a special discount for Trekaroo families and we also get a commission when you book through us. It helps to keep Trekaroo free. This post also includes Amazon affiliate links.